With lawmakers proposing to increase available tax credits through the Alabama Accountability Act (AAA) to $35 million, we are hearing from those concerned about that money being taken out of the Education Trust Fund (ETF), citing different ways that money could be used. 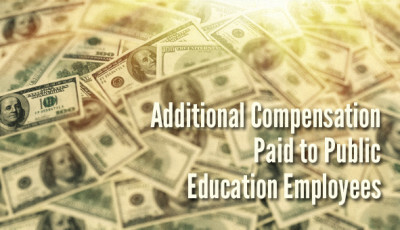 A few days ago, I took a look at the additional compensation paid to school employees through various pathways. One of those pathways is coaching supplements. 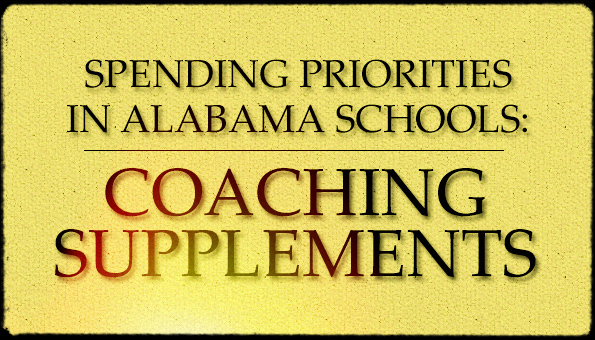 In FY14, Alabama’s school districts paid a total of $37.6 million in supplements to head and assistant athletic coaches. For one year’s worth of coaching duties. $35 million in AAA tax credits for students to escape “failing” schools versus $37.6 million in supplements for athletic coaches. Many folks are under the impression that booster clubs always pay for coaching supplements. That isn’t the case. While a number of school districts have adopted a policy that would allow local booster clubs to pay the supplement amounts as long as certain rules are followed, I was unable to determine the source of funds for each district’s coaching supplements*. In 2007, the Alabama State Department of Education issued guidelines for booster clubs and stated that booster clubs cannot pay coaches directly. All supplements must be paid through the school. It is unknown how many school districts’ booster clubs fund athletic coaching supplements*. However it comes in, whether paid by local taxpayers (the state doesn’t fund coaching supplements) or by communities who supporting an individual sport, it still amounted to $37.6 million last year. And that doesn’t count a coach’s base pay. Nor does it take into account the various expenditures to maintain athletic facilities or bookkeepers or security or any of the other various expenditures associated with athletic pursuits. Before you say it, no, this is not a case against public funding of athletics. It is an opportunity to look at the numbers so we can all have a better-informed conversation about funding of our public schools. The numbers in these tables were obtained from financial reports filed by each school district. School districts report expenditures by “object of expenditure codes”. The numbers in these tables represent only two “object codes”: 197-Head Athletic Coach and 198-Assistant Athletic Coach. Some districts may have chosen not to use these codes to report these amounts, which is why some districts show zero dollars. Differences in reporting among school districts make it difficult to make one-for-one comparisons. But since this is the only information available, it is what will be used to enable us to start this discussion. This article states Auburn High School’s new football coach’s pay at $123,000. Thompson High School’s football coach was hired at $121,000 a year. Hewitt-Trussville’s football coach is paid $120,000 a year. This article from 2013 shows how Cullman High School’s coach’s pay was increased by 62.5% by increasing the supplement he was paid. Here’s another article from 2013 showing Blount County hiking their coaching supplements. All this happened while teacher salaries were going in the other direction. The challenge of properly funding public education in Alabama is absolutely real. But the questions that need to be asked aren’t being asked. The big question is what are the spending priorities for our boards of education? Why aren’t the folks worried about “for-profit” charter schools asking boards of education to commit more of their local resources to basic educational needs? $37.6 million could go a long way to improve educational offerings for Alabama’s children. Is the state supposed to pay one set of bills (for essentials) while the locals pay another (for extracurricular activities)? Who is going to take the hard look at how districts are currently spending taxpayer money and force boards of education to own up to their priorities? Who is going to force boards of education to recognize the either/or decisions that force teachers to fund their own classroom supplies while spending local money on coaching supplements? When choosing between what to spend the public’s money on, who is making those decisions? Are those decisions made in the best interests of all of the children in the school district? Who is asking those questions of Alabama’s local boards of education?